Martin Hayes is one of those quiet, funny, self-deprecating people who don’t look as though they can hold a room spellbound. He travelled from Connecticut to Vancouver to play a three-hour concert on Wednesday night, along with his long-time collaborator Dennis Cahill, at St. James’ Hall, a local community centre. And then he held the audience spellbound. There is something about this advanced level of Irish fiddle playing that unites the room. He begins one of those sweet, lilting, toe tapping pieces. He speeds up. You start to hold your breath. 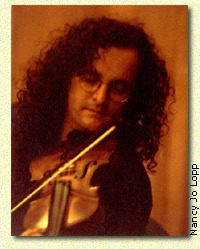 By the end of the piece, he is playing at a speed that has everyone’s heart beating in unison, everyone gazing in fascination at the right foot that is tapping at four times the speed of the left, everyone looking at that blurred point where the bow meets the strings and brings forth a sound of poignant purity. Hayes says he always returns to G Minor, as it has the right tone: “melancholy, though not downright depressing.” Whatever key the music was played in, it resonated with his listeners. He played medleys that included reels and jigs I have never heard of but that spoke to my emotional core as well as my desire to get up and dance. See his website. Join the mailing list to get a free download. Several times in 2011, I considered reading Room by Emma Donoghue, but always ended up avoiding it. Knowing that the story was about a young woman kidnapped and kept in a locked room for years, I didn’t want to expose my emotional self to the material: my over-impressionable subconscious is already haunted by comparable real life cases. I knew the book was entirely narrated by a five-year-old boy, which supposedly created moments of humour that made the grim story bearable, but still — I stayed away from it. 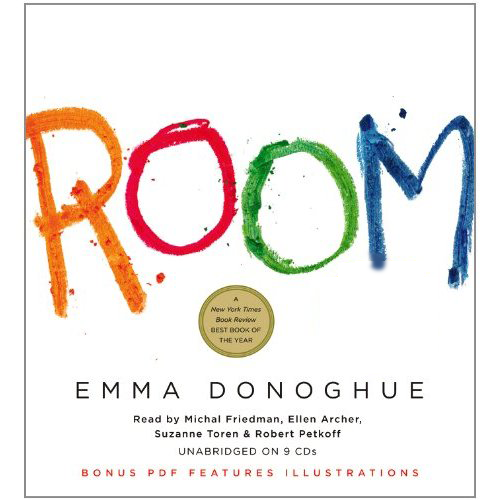 In early 2012, feeling braver, I picked up the audiobook of Room at the library, thinking that I would give it a chance. Listening to the opening chapter was a revelation. The actors who read this book are remarkable — in particular, Michal Friedman, who reads the part of five-year-old Jack, who was born in Room, where his Ma has spent the last six years of her life enduring the visits of the man who snatched her off the street when she was a nineteen-year-old student. Jack is smart and happy and full of curiosity, since the life he knows is full of interest and new things. Ma has created an ordered routine that makes sense of their days. She does her best to teach Jack about the world while maintaining the fiction that they and the man (“Old Nick”) are real and everything else is “TV.” They have a television, but Jack’s watching time is limited, since Ma tells him that if they watch too much their brains will rot. She is a survivor and she is waiting and biding her time for some future possibility of escape. Donoghue lets the reality of their situation dawn gradually and I envy readers who came to Room before the elements of the story became widely known. I jump way in the air. Usually, I’m not allowed draw on any bits of Room or furnitures. When I was two, I scribbled on the leg of Bed, her one near Wardrobe, so whenever we’re cleaning up, Ma taps the scribble and says,”Look, we have to live with that forever.” But my birthday tall is different, it’s tiny numbers beside Door, a black 4, and a black 3 underneath, and a red 2 that was the color our old Pen was until he ran out, and at the bottom a red 1. The eponymous Room is a garden shed. Old Nick has reinforced it to make it soundproof and added a steel door with a coded entry lock: you come to the chilling realization that he must have created this above-ground dungeon while making plans to abduct someone. Their only natural light comes from a skylight. The horror behind the bright little voice is a steady presence in the background. Jack knows that Old Nick is to be avoided: he sleeps in the wardrobe and has to keep quiet if he is still awake when the man comes in, his arrival heralded by the beeps of the door lock. Nick sometimes hurts his Ma but usually he just creaks the bed. Jack lies awake and counts the creaks. Ma takes painkillers (“killers,” to Jack) to deal with physical ailments like toothache and a damaged wrist, and perhaps also to dull other kinds of pain. Around Jack’s fifth birthday, Ma learns from Nick that he has lost his job. Since he already keeps them on a tight budget, she fears that he will stop bringing them food and other necessities. He may even lose his house, and then they will die: they have no way of contacting anyone in the outside world. Jack is too young to learn the truth about their lives, but there is no option: she has to come up with a plan and drill Jack into playing a part he is not really ready for. The second half of the book is about life on the outside. You might think it would be anticlimactic, but no: it’s equally compelling. Much of the outside story reflects the imperfection of person-to-person communication, made more striking by the gulf between the normal world and the world Jack and Ma have lived in. Well-meaning medical staff and relatives find that their ideas and language fall short of what is needed. Ma is hostile and defensive; Jack can’t bear to be parted from her, because she is his world. The outside is not at this stage a paradise: it is strange and difficult. It’s not two seconds. It’s 37. The actors are stellar. Michal Friedman* as Jack is flawless. Ellen Archer is Ma; Suzanne Toren and Robert Petkoff play a whole cast of characters, from Nick to Doctor Clay, Officer Oh to Nurse Noreen, Grandma and Real Grandpa and Stepa, and more. In hindsight, I wish I’d read the book and then listened to the audiobook: there’s not much point in doing things the other way around as the audio interpretation would override the reading experience. Room was a significant literary success: winner of the 2010 Rogers Writers’ Trust Fiction Prize among other prizes and a finalist for the Booker. Those successes are entirely deserved. Emma Donoghue has taken on a monster and she gives us glimpses of the evil that lies in the background but, by telling the story from Jack’s perspective, she focuses primarily on the relationship between mother and child and the absurdities of human behaviour. * Michal Friedman, who created such a bright young voice for Jack, was a woman who was well known for her work in voiceover, particularly in anime, as well as her life as a singer/songwriter. Tragically, she died in November 2011 of complications following the birth of healthy twins. Christopher Hitchens is an opinionated, witty, often harsh writer who defies political pigeon-holing. Among other things, he is noted for his support of atheism and the Iraq war. He is also now a cancer patient. In an article for the September 2010 issue of Vanity Fair, Hitchens describes receiving a diagnosis of esophageal cancer that had metastasized to his lymph nodes and lungs. In his writing, he remains completely himself at this stage of the disease, being willing to confront the diagnosis and its likely end result with his own candid, articulate and personal touch. The article encapsulates his approach to life and now, I suppose, to death. My generation approaches cancer and other potentially fatal diseases differently from my parents’ generation, who rarely used the word. Their discussions of terminal illnesses employed euphemism, lowered voices, and vagueness as to detail. I don’t remember hearing any of the patients themselves talking about their condition. In contrast, we learn everything we can about medical vocabulary, symptoms, and treatments. My friend Teresa, who died in 1999, was the first of my contemporaries to openly discuss what she was experiencing. She provided summaries that I emailed to a large group of friends: a very personal gift of intimacy and knowledge that opened up the hidden world she had abruptly moved into. … I wasn’t quite prepared for the way that my razorblade would suddenly go slipping pointlessly down my face, meeting no stubble. Or for the way that my newly smooth upper lip would begin to look as if it had undergone electrolysis, causing me to look a bit too much like somebody’s maiden auntie. (The chest hair that was once the toast of two continents hasn’t yet wilted, but so much of it was shaved off for various hospital incisions that it’s a rather patchy affair.) I feel upsettingly de-natured. If Penélope Cruz were one of my nurses, I wouldn’t even notice. In the war against Thanatos, if we must term it a war, the immediate loss of Eros is a huge initial sacrifice. Hitch wants to live to write “the obituaries of elderly villains like Henry Kissinger and Joseph Ratzinger” and I hope that his current battle (he comments on the peculiar struggle imagery used uniquely of cancer) allows him to write for a number of years yet. The weekend of 16-18 July saw the 33rd annual Vancouver International Folk Festival. You go for the great music, of course, and this year brought the usual new discoveries: the Peatbog Faeries (Celtic fusion complete with bagpipes), Mauvais Sort (French fast foot-stomping, fiddle-playing folkiness); confirmation of recent interest (Po’ Girl‘s jazzy urban folk with Allison Russell’s spectacular voice and instruments ranging from clarinet to bucket), Deep Dark Woods‘ rocking roots style); and delight in old timers who can still hold an audience spellbound (Jim Byrnes, Connie Kaldor). But after the music, the second best part of the festival is, without doubt, people-watching. From the grey-bearded, sandalled veterans in unflattering shorts to the young and the tattooed; from lesbian couples snuggled up under the trees wearing one jacket between two, to face-painted children eating whales’ tails, to the ancient hippie guy who dances in a headscarf and a skirt to young women in original sartorial combinations of the decorative and the utilitarian — it is all a feast for the senses. And a special award goes to the woman of advanced years in droopy shorts — wearing the forbidden combination of socks with sandals — who nevertheless danced unselfconsciously to the gospel music on Sunday morning while giving her partner unmistakably seductive looks. My daughter is going to Nice this summer on a school trip. 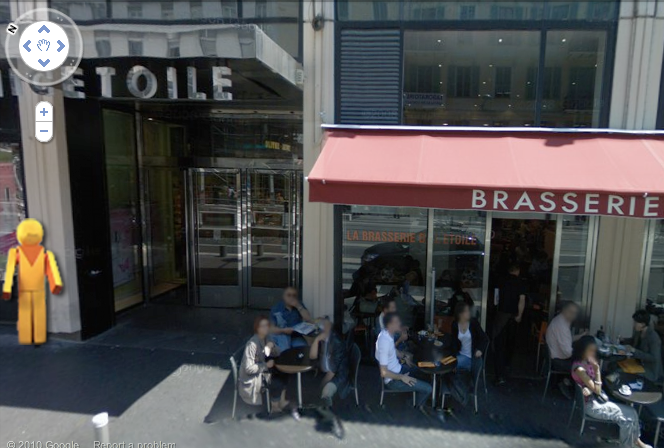 When we got the address where she would be staying, I — of course — looked it up in Street View on Google Maps. There I am, nine thousand kilometers away, virtually walking along the street where she is going to be staying. It’s a block away from a palm-tree-lined promenade by the water. I can see the restaurants where she might eat and the stores she might shop at. I’ve looked up the house in Wales where my mother lived, to see whether the new owners have done any major repainting or landscaping yet. It makes me feel like a stalker, but it is irresistible. In a more benign vein: inspired by my reading of Northern European mysteries, I looked up some locations in Sweden, Norway, and Finland so that I could get a sense of what it was like to be there. I’ve virtually travelled the world in recent months with Street View (and yes, that word “virtually” has taken on a new, specific shade of meaning). When I perform one of these electronic acts that has only become available in recent years, I’m strangely affected by the experience. It is so unlikely, almost miraculous. Yes, I know in my head that the technology is available, but each time there is an impact beyond what I expected. Unlike many other things that get so described, this deserves to be called both weird and wonderful. I love this video. I love the music, the lyrics, the light, the way the singer sways gently and lovingly with his guitar, and the fifties Mediterranean wedding scene. I first heard the tantalizingly different Paolo Nutini on the radio, singing High Hopes. I couldn’t imagine what he would look like: there was a warble in his voice that made me think he might be old; the accent was hard to pin down; the song started with a hint of Amazing Grace, and continued as a sort of reggae ballad. When you first see him, it’s hard to reconcile his sound with his appearance and his appearance with his name (his father, as you might guess, is of Italian descent but the family has lived in Scotland for generations). Paolo Nutini is 22. He is from Paisley, near Glasgow. His voice is odd, really: that warble and a croakiness, but it works. After listening to Nutini singing Candy a few times, it seems like all aspects of him meld perfectly into a distinctive whole. And he seems to throw himself, heart and soul, into making music without worrying too much about crafting a consistent image. He’s a talented songwriter who performs a lot of his own material, with influences from folk to blues to ballads to ragtime. His recent album, Sunny Side Up, defines the word eclectic.